Are you single and looking for a travel adventure? Thailand has exactly what you’re looking for in its exotic places, and it’s budget friendly upon arrival. Single girls everywhere are taking initiative and booking that flight to Thailand. So, go ahead and broaden your horizons and discover a new culture! This popular right of passage is something epic to embrace! 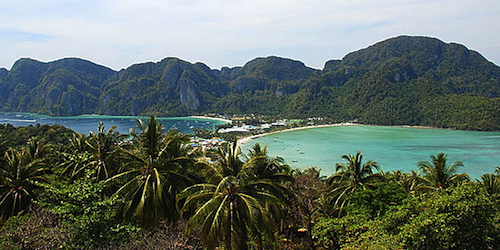 Here are the best ways to experience Thailand for the ultimate single girl’s adventure! Upon arrival, you’ll begin your journey with tired eyes as you jump into a licensed cab to your pre-booked accommodations in Bangkok. This is the best time to review your travel guide, brush up on basic Thai phrases and make note of the best routes to some beautiful Buddhist temples. A great way to soak up a new climate and culture (once your jet lag has faded) is to go explore this exciting city, and I suggest visiting the Grand Palace first. 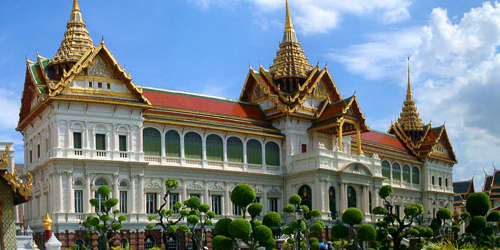 It’s authentic Thai architecture, gardens, statues and courtyards will inspire you and make you camera happy! 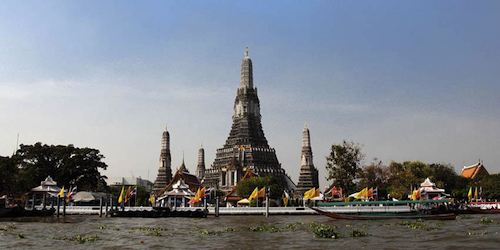 The Grand Palace is near the Chao Phraya River where you can cross the river, on a riverboat, to Wat Arun Ratchawararam, also called the Temple of Dawn, which is a beautiful landmark next to the river. Try using the riverboats to explore different areas of the city along the canals, or use the MRT (Bangkok Metro) and the BTS Sky Trains for speedy transit service almost anywhere. Fares are reasonable, and you can purchase a pass to make it easier. 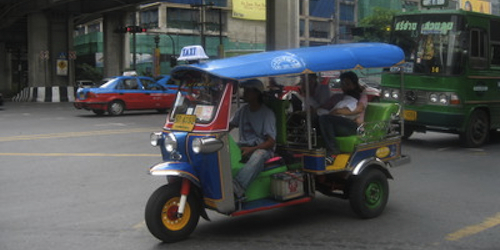 For short distances around your hotel or hostel, try a tuk-tuk or motorbike taxi to get around, since they’re cheap. They should only cost from 20-100 Baht if you’re not going that far. Always negotiate a price before you get on! If you’re really adventurous try boarding a Bangkok bus and see where it leads! Bring a map, money and cell phone around at all times! And, if you must take a cab, insist on using the meter to avoid being overcharged. After your excursions around town, sit back and enjoy a refreshing tropical drink at one of the street-side restaurants along Khao San Road, which is the ex-pat mecca of Bangkok. Here you’ll find people from everywhere in the world and they’ll probably have many stories about travelling for your entertainment! 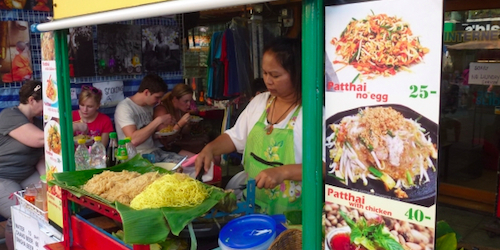 Street food vendors and restaurants are everywhere in case you get hungry for some authentic Pad Thai, or Som Tam (spicy papaya salad), which are favorites. 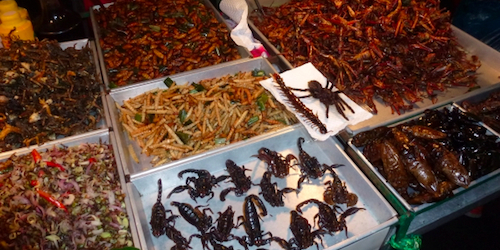 If you’re feeling adventurous, you can also try some deep-fried bugs that are sold on Khao San Road! Why not, they’re crunchy and full of protein! For those who aren’t afraid of heights and want a luxurious nightlife experience, head to the popular Sky Bar, which was featured in The Hangover II, on the 63rd floor of the Lebua Hotel. 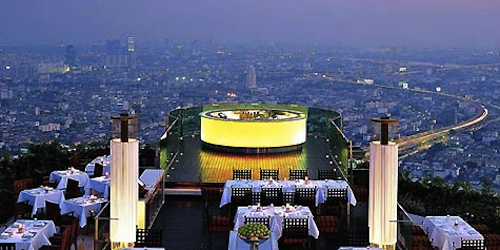 You’ll find amazing views of Bangkok, and it’s conveniently next to the award-winning Sirocco Restaurant where you can dine. 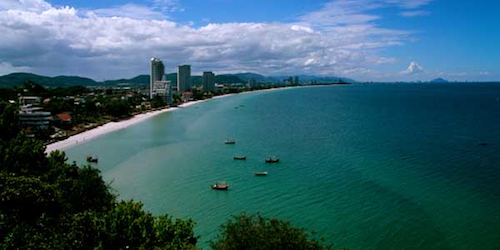 Hua Hin is a laid-back, charming beach town can be found three hours south west of Bangkok. This quiet town features gorgeous beaches that are even popular with the King of Thailand who lives in Hua Hin year round! Hua Hin includes plenty of places to see like “Monkey-Mountain” where you can feed corn to monkeys, and has a number of popular tourist activities like, swimming, golfing, fishing, kite-boarding, horseback riding, pony rides, rock climbing, hiking, and the great Cicada night market to explore. Tonsai Village is a place where they have no roads, only paths for walking or riding a bike! Check out this small village that is located on the isthmus in Koh Phi Phi, with Loh Dalum on the north side and Tonsai Bay on the south. The cool white sand and crystal-clear water on either side will make you feel like you’ve stepped back in time with its lush, unspoiled scenery that makes Tonsai Village unknown to many. It screams tropical paradise! 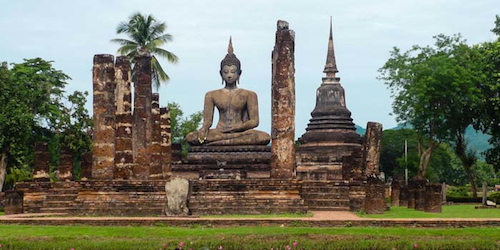 If you plan on visiting the north of Thailand, be sure to visit the ancient ruins in the Sukhothai Historical Park, which feature 193 ruins on this massive 70 kilometers of land. It is considered a World Heritage Site and is definitely worth seeing either by bike or walking. Ancient ruined temples, Buddha statues and palace buildings will leave you memorized. 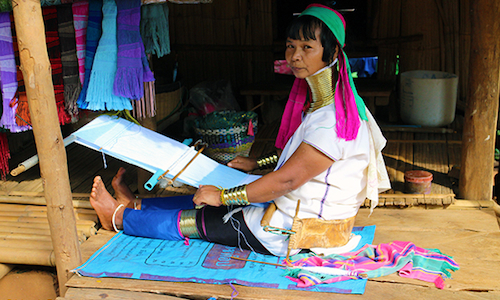 Try a sightseeing tour to explore the Tad Kwan Village Park and Waterfall in this northern area of Thailand near Chiang Rai, or visit the Long-Neck Karen Hill Tribe in Mae Hong Son, outside of Chiang Mai, where you can meet local tribe members who will let you discover their authentic surroundings and take pictures. Check out the nightly market in the eastern part of Chiang Mai where you can browse hundreds of shops and street stalls for some awesome souvenirs! 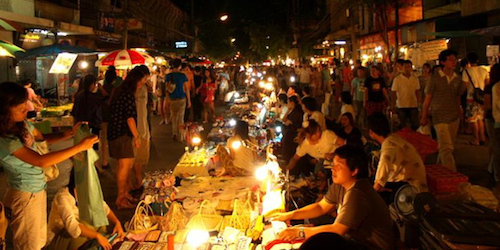 The Saturday and Sunday walking street markets are worth checking out if you’re visiting over a weekend. 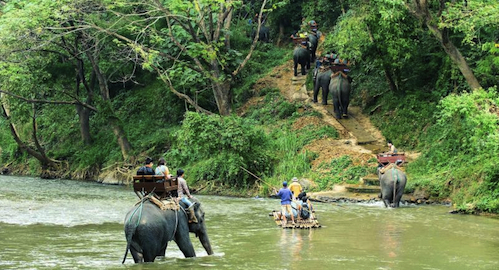 In Chiang Mai, take an elephant nature walk, or go for an elephant ride at one of the elephant sanctuaries where you can explore the jungle and northern landscape. On Koh Chang lsland, there are bike rentals all around the island for the amazing cycling trails, which is a great way to discover this island, or try trekking across the beaches. 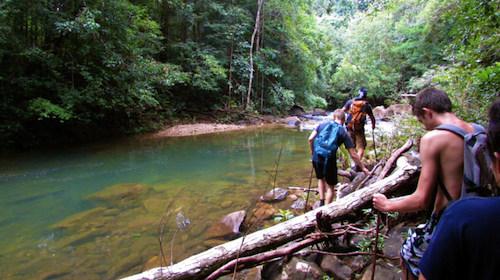 You can also sail around the island stopping at different areas to explore, and go then go hiking inland to the Klong Neung Waterfall as a mini jungle trekking adventure. For a fun and relaxing adventure on Koh Chang, there are elephant treks and tours available at one of the elephant sanctuaries where you can get up close with the wildlife. 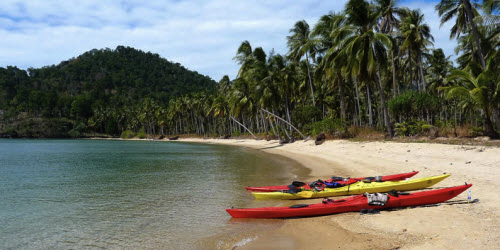 You can take a sea kayaking course at Amari Emerald Cove, try snorkelling through the marine life, or go on a diving tour with a Master Diver for something exciting to do in the ocean. Obviously you don’t have to be a single girl to enjoy this adventure, but if you are, this is for you! For more information on the various areas of Thailand to visit, visit tourismthailand.org or tatnews.org for the latest updates on Thailand’s tourism authority.